This trend originated a couple of years ago and it’s still managing to bedazzle people with its stunning appearance. Infinity pools have become increasingly popular, especially in those minimalist house designs as they offer a sleek and simple form, characteristic for this style. The pools are designed to look as if the water is flowing over the edges without a specific limitation, creating a visual illusion of no boundaries. Not only are these designs quite aesthetically appealing, but they also offer a glistening touch to the whole setting. They make a wonderful addition in spaces with great scenic views, which is why they’re particularly represented in luxury resorts, hotels and similar facilities. We can expect a lot of these designs in 2017 and given the fact that the trend of vanishing edges can be quite pricey, it’s only smart to start saving right away. 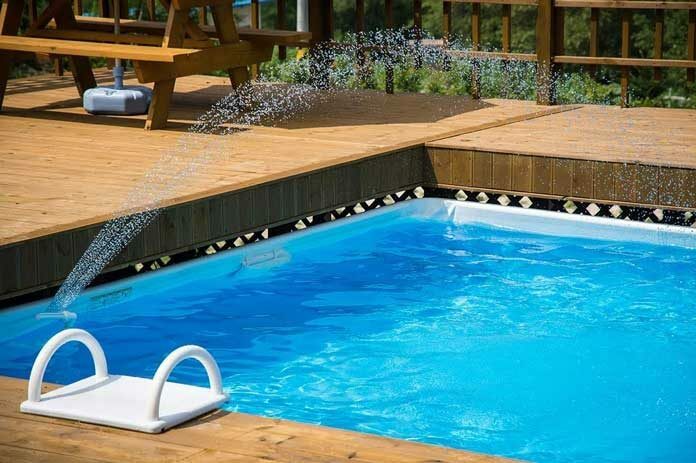 In order to try and evoke the true sensation of the beach life, experts in the pool industry have decided to introduce the newest feature for the following year that’s going to create a true seaside setting, right there in your backyard. Beach entries are becoming the next best thing now, as they allow you a smooth descend into the pool, as if you’re walking gradually into the open ocean. Other than this, tanning ledges are becoming increasingly popular and more people are opting for these shallow pool areas, designed specifically to sit back on your lounge chair and enjoy the warm rays of sunlight on your face. Besides sunbathing, many people use these ledges as play areas for children. Another great trend, which is a result of the prominent environmental issues that are affecting the whole world, is introducing natural features in the swimming pools, as a way to become more environmentally aware. These pools are designed to be completely eco-friendly and don’t’ use any chemicals. Instead of chlorine, natural pools make use of aquatic plants and sand filters to maintain the cleanliness of the water, but also incorporate plant life around the pool to achieve a completely natural ambiance. The best thing about these pools is that they’re actually much cheaper than regular pools and are a great option for anyone who’s seeking a budget-friendly option for their home. If you have a limited amount of space in your yard and desperately want to add a pool to the setting, it’s good to keep in mind that smaller pools are going to overrule in 2017. These pools give you the ability to take advantage of the full potential of your backyard and make it functional and practical. Because of their distinctive features, plunge pools are the best choice if you’re looking for a smaller sized pool or an intimate water addition to your yard. There’s no reason to spend 2017 crowding in public pools or paying great amounts of money for spa resorts when you can easily create your own sanctuary in the comfort of your own home. But before you make your final decision, make sure to consider some of the hottest pool trends for the next year and choose something pleasing to your eye. Diana smith is a full time mom of two beautiful girls interested in topics related to health and alternative medicine. In her free time she enjoys exercising and preparing healthy meals for her family. Why is it important to Diagnose Cancer Early? Are You Getting the Best Out of Your Yoga Practice?